Balleen castle was the residence of the Mountgarret family. It consisted of a large ancient keep, to the south of which was a lofty square building, both connected by a long hall or house. The keep dated probably from the fifteenth century and stood in ruins until approximately 1875, when it collapsed. The high square building to the south had walls of not more than 60 cms. thick. Richard, third Vicount Mountgarret, who made some additions to Balleen castle in this year, probably built it in 1647. In 1596 “Ballyn” is mentioned among the principal residences of the County Kilkenny. Richard third Viscount Mountgarret, appeared to have made Balleen his residence, in preference to Ballyragget, where his father and grandfather had lived before him. 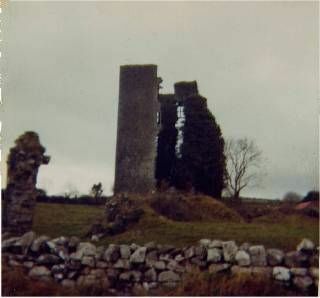 There is a tradition, handed down in Irish, that Balleen castle was never finished and was never inhabited. The story goes that, as the tradesmen who built it were nearly finished the building, a raven flew over their heads and told them to proceed no further as the Lord of Balleen had just become a ruined man. They left the castle immediately. If the castle was not begun until 1647, the unsettled state of the country during the next two years, followed by the arrival of Cromwell and the flight and death of Lord Mountgarret, would easily account for its being left unfinished.